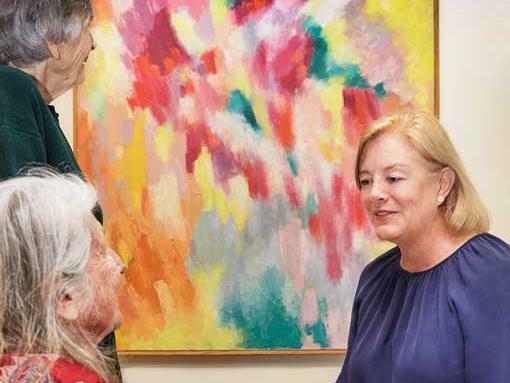 A study into the Art Gallery of New South Wales’s (AGNSW) Arts Access program for people living with dementia highlights the pleasurable experience that looking at art brings for people with dementia as well as their carers, family members and health care professionals. The program was inspired by a similar arts access program for people with dementia set up by The Museum of Modern Art (MOMA) in New York ten years ago. Recognising the beneficial impact of engaging with artworks at MOMA, the AGNSW ran a pilot program inviting people living with dementia to view iconic works in the gallery collection. Now each month a group of people living with dementia visit the gallery and view artworks with specially trained guides who have an in-depth knowledge of the artworks. The study into the program, entitled Arts Engagement for People with Dementia, was headed up by Dr Gail Kenning PhD, University of Technology, Sydney. Dr Kenning says the study involved both qualitative and quantitative research. Artworks selected for the study include iconic Australian masterpieces, works from international touring exhibitions, award-winning works from annual exhibitions such as the Archibald, Wynne and Sulman Prizes and AGNSW collection ‘audience favourites’ such as Elioth Gruner’s Spring frost (1919). “While dementia impacts cognitive and physical functioning and memory, consciousness and emotions remain intact. This means people living with dementia show affective responses and can experience the pleasure of looking at and talking about art,” says Dr Kenning. As a small group viewed Herbert Badham’s Breakfast piece, they reminisced about times when they would formally set the table for lunch with a table cloth and napkins. Other participants noted the painting has been made at the beginning of WWII. The trained program facilitators, in turn, spoke of their joy in seeing people come quietly into the gallery and then suddenly “open-up and start talking”. Dr Kenning highlights the study did not focus on memory, and whether people living with dementia remembered their engagement with art, but recognised the positive impact of ‘in the moment’ pleasure of experiencing art and of feeling valued, supported, acknowledged, and challenged. The findings are supported by Alzheimer’s Australia NSW as they provide a valuable evidence-base for the outcomes of such programming. Recent research has indicated that social isolation and loneliness are the most significant issues people face once diagnosed with dementia.